Biggleswade suffered their worst ever league defeat in Midlands 3 East (South) going down 86-8 to Rushden & Higham just two places above them in the league. 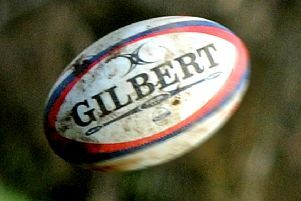 Biggleswade scored first and last but in between the hosts ran in fourteen tries. On an afternoon when the Sun made fitful appearances there were some flashes of brilliance on the pitch too from Biggleswade. But when a good tackle was made there was no second player to take out the supporting receiverr. And in attack when a good break was made there was no-one on the shoulder to carry on the move. Biggleswade kicked off and had the first points on the board with a successful kick from Elliott Tunstall restored at fly-half. But there was no further Biggy score for seventy-five minutes. Every side needs confidence to run through their attacking moves. After a dreadful season which saw them languishing dangerously near to the relegation zone Rushden were no exception. But once they realised that the visitors were not used to playing a wide pitch they soon found the gaps and the scores mounted steadily. That it didn’t top a ton was because Biggleswade did keep trying and made the opposition work to get into a scoring position. But so often once Rushden did get close the covering tacklers were not there to support the initial stoppage and it was a stroll over the line without challenge. Late on Del Tribeck brought a smile to the loyal band of Biggleswade followers as he crossed the line for a try in the last move of the match. The mantra at training is “last try wins”. Oh that it was true in the real game! Rooted to the bottom there are just three games left for Biggleswade to play. Next up is St Neots at home who beat second placed Stamford last week-end. Then there is a visit to Stamford followed by a final match against Stockwood Park at Langford Road. Both home matches have a pre-match buffet and kick off at 3pm. The team needs some support to keep going in these tough times.